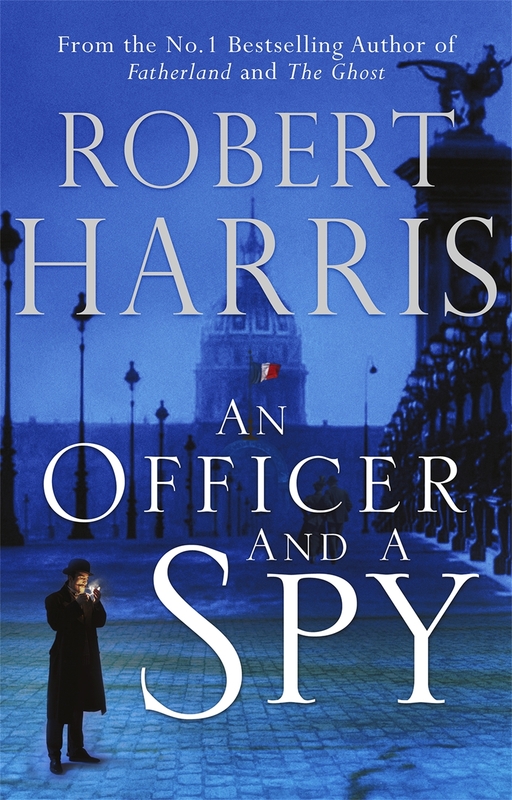 JUST COMPLETED A wonderfully well-written, excitingly narrated story: Robert Harris’ “An Officer and a Spy”. 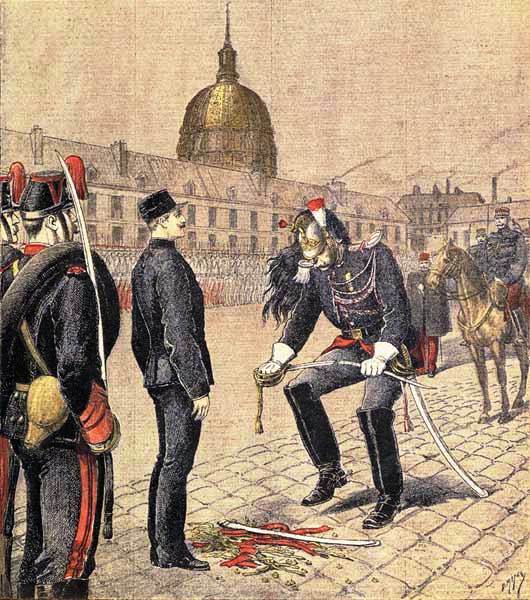 The story, seen through the eyes of its hero (he’s much more than the morally neutral ‘protagonist’), Georges Picquart, recounts the circumstances around the wrongful, anti-Semitic, imprisonment of Alfred Dreyfus, a French army captain in 1895. Dreyfus was publicly stripped of his uniform and his honor and condemned – as a spy- to life in a God-forsaken prison on Devil’s Island. It is Picquart, a fellow army officer and himself initially anti- Semitic, who stumbles upon what he realizes is a web of lies, forgeries and ‘evidence’ fabricated by the very highest levels of the then French administration. As he doggedly peels away layers of obfuscation to get to the truth, his socialized anti- semitism peels away as well. But the truth, far from setting him free leads only to ostracism, exile and imprisonment. The swift, ever- moving story begins like a cloak and dagger spy adventure and morphs mid-way through into a brilliant series of courtroom dramas, as it gallops toward its thrilling denouement. Like the best of ‘historical fiction’, Harris’ embeds the reader deeply into the period and into the lives and emotions of his characters. 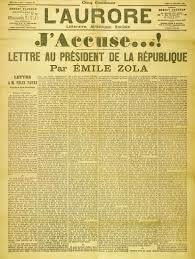 They’re all there, brought to life for us: Dreyfus – aloof, stoic, despairing; Picquart, resolute, angry, often naive; the scheming Ministers of War, Generals Mercier and Billot; the novelist, Zola, outraged enough to shake the conscience of the nation with “J’Accuse” ( for which he was jailed); the many lying, devious army officers looking out ‘for number one’. And, perhaps one of his principal characters: the mob. It is their virulent, murderous anti-Jewish attitudes that form a braying and increasingly dangerous background to the action as it unfolds. They reflect the sentiment of a world against which Picquart must fight. Here is the voice of democracy at its worst. Like the court cases that underpin the story, Harris builds his own case slowly and meticulously. Not a scene is wasted as he laminates Picquart’s discoveries, the opposition that steadfastly mounts against him, and his own complicated love affair with Dreyfus’ increasingly desperate living conditions and the always shifting sands of a precarious Franco-German relationship, to create a wonderfully textured tale. We become one with the hero through his journey from a young, lionized careerist officer, focused on promotion and praise to a man brutalized and brought down by the very people who lifted him up. The choice he faces in this novel set in the nineteenth century is the uber modern predicament of the twentieth: close your eyes, obey the corporate code and prosper or look deeper and expose yourself to the darkness that truth can unleash. What Picquart, the quintessential army man, discovers to his horror is the moral vacuum that exists at the heart of the corps. Truth, to the army and to the government that supports (and is supported by) it is what it deems it to be, not what it is. To the omnipotent administrators, a facsimile of the truth shaped by them is the only narrative that can be allowed to exist. It is the only sure route that can possibly ensure its own continuity, no matter the collateral damage. IN a sense, Picquart is the Everyman whistleblower. Not unlike the ever unfolding drama of Edward Snowden, ‘An Officer and a Spy” examines the demands of conscience v conformity and the lengths the State, threatened by the truth, will go to protect itself. 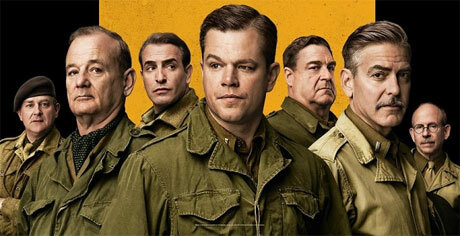 The Monuments Men. Read the Book Instead. THE MONUMENTS MEN, is a loosely based telling of the work of the Monuments, Fine Arts and Archives Division of the Second World War and George Clooney’s homage to those sixties war movies: “The Guns of Navarone”, “Von Ryan’s Express”, “The Great Escape” and “The Dirty Dozen” (among others). Apparently he and co-writer Grant Heslov (“The Ides of March”, “Good Night, and Good Luck”) used those movies as their inspiration and guide. 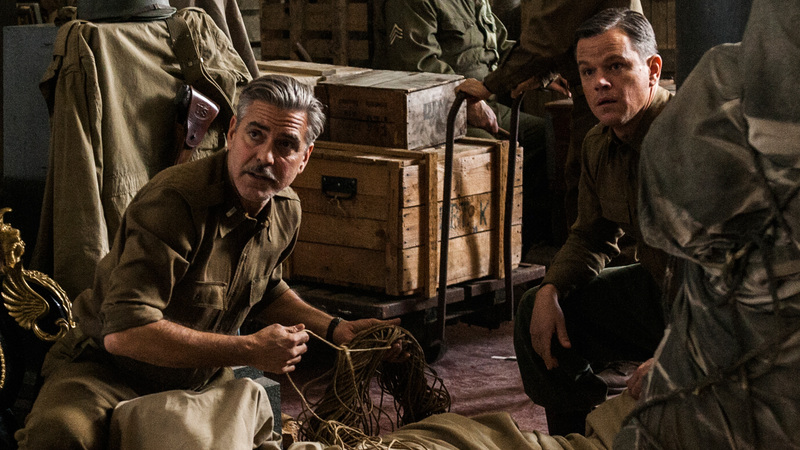 And it shows, for what we have in “The Monuments Men” is a curiously old-fashioned, dated and jingoistic re-telling of what should have been a thrillingly exciting ‘adventure story’. Clooney’s movie makes a very clear case. As hero Frank Stokes (Clooney) says, “if you destroy their achievements, their history, it’s like they never existed”. For him and his fellow Monuments Men, the seemingly quixotic attempt to prevent the Allies bombing out Europe’s great cultural institutions and finding the tens of thousands of art objects pillaged by the Nazis, was more than simply protecting paintings and pillars. It was about protecting those valued objects that comprised a people’s sense of self and cultural identity. In this story, a prescient Stokes persuades Roosevelt of the need to create and empower this division. One of his early recruits is art restorer James Granger (Matt Damon). With Granger onboard, the team is comprised of seven persons. Now, I don’t want to impose too much ‘reality’ on the necessary license of fiction, but the impression that it took a Yank with a few others to rescue European civilization is a tad exaggerated. In actual fact, the MFAA division (those Monuments men) was comprised of over 350 officers and was actually initiated by two Brits: Mortimer Wheeler, an archaeologist and John Ward Perkins, an art historian. Certainly, to give credit where it’s due, the Americans, led by one Robert Posey (on whom, perhaps Clooney’s character is based) injected huge energy (and firepower) to an overly Academic British initiative. But historical exaggeration is not my issue with this movie. The central problem is that Writers Clooney and Heslov never quite figured out how to knit together all the sprawling threads of the story. For “Monuments…” seeks valiantly to combine a detective drama, with a moral enquiry – is any painting worth a human life? with enough character development to engage our interest, all within the dangers – and politics – of a world at war. The detective drama is largely underdeveloped and pretty much without a shard of tension and excitement. In the story, they figure out that the art – in particular the twelve paneled van Eyck, “Adoration of the Mystic Lamb” and a Michelangelo Madonna and Child – is buried in a number of Austrian salt and ore mines, which they get to, and, eager to beat the advancing Russians, locate and spirit away. In an excitement-free zone, along the way, a couple of them get killed. Let’s briefly shift back to ‘reality’. There was one, Gauleiter Eigruber, an SS commander, who on Hiltler’s orders had been commanded to destroy all the art in the main mine at Alt Aussee, should the Reich fall. Eigbruger took his command to heart and wired to mine to blow up everything. What he was unaware of was that the local miners were having nothing of this. They sabotaged the wires so that it only blew the entrance. But Eigbruger was not to be so easily denied. He killed a few of the saboteurs and set about one more to complete the task he’d been given. He worked all through the night, and it was pretty much with minutes to spare that he was stopped – by the arrival of the monuments men. The great art of Western civilization was literally minutes away from being destroyed. And it’s not what you get in this movie. As to the characters – they remained wooden cyphers, with Clooney as wooden as a panel of a van Eyck painting. Even the usually outstanding Matt Damon seemed confused as to who he was meant to be – a sort of cool smart talking dude, sort of seductive sleuth, sort of a happy domestic father and sort of astute art academic. Perhaps he was pining simply to be Private Ryan all over again. The others – Bill Murray, John Goodman, Brit Hugh Bonneville, Frenchman Jean Dujardin and Cate Blanchett as the spy who showed the way, all seemed to be extra bodies. Mere additions to the “all star cast”. Essentially, we were introduced to a bunch of famous actors in battle fatigues, none of whom managed to engage us enough to give a damn. Who can but remember in “The Great Escape”, the ever cool Steve McQueen bouncing his ball in solitary and flying over barriers to try to elude pursuing Germans, or James Garner, the slick con-man who could procure pretty much anything needed, or Charles Bronson, the tunnel man afraid of tunnels or Donald Pleasence, the near blind forger cleverly creating passports from nothing. These characters turned an escape movie into a thrillingly engaging human drama, a battle against odds. All I leave you with is this. The movie begins with the seizure of the van Eyck panels. There are twelve of them, one of which was stolen in 1930. This panel – called the Judges panel – Hitler hoped would lead him to the discovery of the Arma Christie (the thorns, nails etc used in the mortification of Christ). The panel is still missing (the one there at present in the Cathedral in Ghent is a facsimile painted by one Jan van der Veken, who may or may not have been one of the thieves). Now there’s a story waiting to be written. Apparently, several other big names, such as Brad Pitt and Bradley Cooper had shown interest in this un-bankable script. 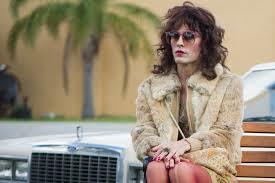 No-one wanted to back a movie about Aids, and transvestism, where the good guys is a bum and dies in the end. Just as well. 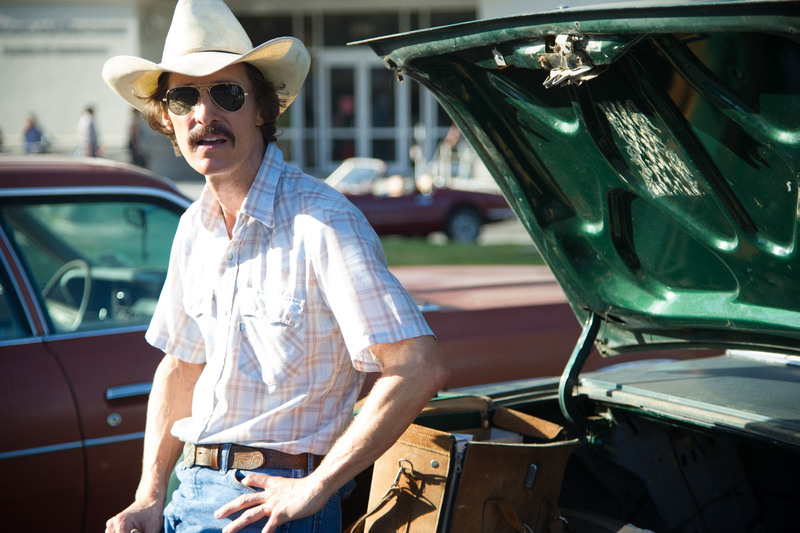 It’s a movie that McConaughey owns so thoroughly that you can’t possibly imagine any other actor in the role. Ron Woodroof, McConaughey’s –real life – character, is an unlikable homophobic, loose-living, drug taking, alcoholic ladies’ man. A gaunt, skeletal McConaughey manages to invest this disreputable reprobate into someone the audience can root for, as, driven to extremes, he cons his way into becoming an unlikely champion of dying, mainly gay HIV sufferers, desperate for life-prolonging drugs. The story follows the battle for survival of said Woodroof, who is given one month to live after he’s diagnosed with AIDS. Set in Dallas in 1985, when AIDS was very much seen as the gay man’s disease, Woodroof’s search for a cure leads him initially to illegally purchased AZT, then being touted as a potential cure. AZT simply strips away much of his immune system, which is slowly re-built by the care of a renegade doctor in Mexico (Griffin Dune). It’s here in Mexico that Woodroof has the revelation that the non-FDA approved drugs available there, which are working for him, can be a potential life-line to many back in the USA. Since it’s illegal to sell non-FDA approved drugs in the USA, he starts up his Dallas Buyer’s Club: a membership only club, where members are given the drugs. Woodroof’s search for the cocktail of drugs that leads him to Japan, Amsterdam and Israel, also becomes his journey of redemption. Slowly we see emerge, flashes of genuine empathy, decency and a kind of rebellious heroism. Woodroof’s virulent homophobia flakes away to reveal a man of conscience, flavoured with old fashioned, seductive Southern charm. McConaughey’s brilliance is that he keeps his characterization richly textured. Woodroof doesn’t change from sinner to saint; he simply manages to channel his outlaw attitudes away from self-destructive drugs and drink toward something far more productive: programs that help others via the evasion of FDA laws. Director Jean-Marc Vallee (“The Young Victoria”) never allows the story to slip into mawkishness. Woodroof’s battle to find drugs that work isn’t some sort of act of selfless heroism. As the title suggests, this is about business. Woodroof is running a business, and like any savvy businessman, he has to journey the world in search of reputable suppliers. He just happens to be dealing in illegal drugs that deliver healing, not highs. Along the journey, Woodroof forges two deep friendships – a practical, business-driven friendship with Rayo, a cross dressing drug addict (Jared Leno in the role of his career) and Eve Saks, a doctor torn between her duty to her patients and her loyalty to what she realizes is a morally compromised hospital administration (a vapid Jennifer Garner oozing sympathy and entirely outclassed by the McConaughey/Leno double act). The barnstorming performances of McConaughey and Leno are so all-absorbing that it’s easy to be distracted by the bigger issue “Dallas Buyers Club” hints on: Big Pharma’s corrupt practices and its too cosy relationship with the FDA. The story notes that the initial drug trials and emphasis on AZT was prolonged despite early – published -warnings of the potential dangers of the drug. It was people like Woodroof (the movie only skirts on the work of groups such as ACT UP and others such as the Florida Buyers’ Club) whose search for alternative treatments – and not the FDA – that helped de-stigmatize the disease and drive for safer drug ‘cocktails’. But the story only notes this. What’s lacking in the movie is a stronger sense of a governing idea. It’s primarily and almost exclusively about Woodroof and Leno. The contrast between their illegal business practices and Big Pharma’s immoral ones are stated but never really explored. Woodroof must battle not only the law, but a legal system sponsored by Big Pharma. It’s good stuff that’s inserted from time to time, but never quite explored. Of course it would be unfair to criticize a work of art for not doing something you’d expect it to. My problem with “Dallas Buyers Club” is that, though it’s a deliciously, enjoyably well made film (shot in 25 days and costing all of $5M), at its core it feels hollow. It’s a glittering display of brilliant acting, but the protagonist’s rebelliousness heroism is not matched by any rebellious heroism on the part of the film. It’s pays liberal lip service to the fundamental corruption at the heart of drug testing, but nothing much more.